Small and midsized business (SMBs) use emails from vendors like you to get business advice and to decide what to buy. 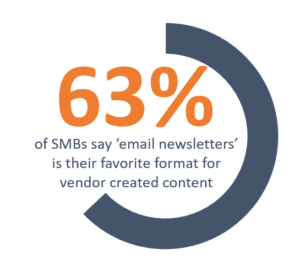 63% of SMB principals in a recent Bredin survey cited email newsletters from vendors as their most-preferred content format. And close to half reported that they are more likely do business with a company if they receive its newsletter. Bredin’s email newsletters typically outperform industry norms since we understand the content formats, topics, style and design that compel SMBs to subscribe to and read a newsletter. Here is some of the intelligence that informs Bredin’s SMB email newsletter writing and design for clients. Half of SMBs with 20 or more employees prefer a weekly newsletter. Companies with 19 or fewer employees prefer monthly. The top three places SMBs sign up for email newsletters are on vendor websites, at events, and via an email forwarded to them by a peer. Contact Bredin to learn how we can help you create a high-performance email newsletter.